My last couple of Surname Saturday posts have been about families for whom I can’t go back very far, so I’m excited to write about the Whiteners – they are a well-documented bunch. 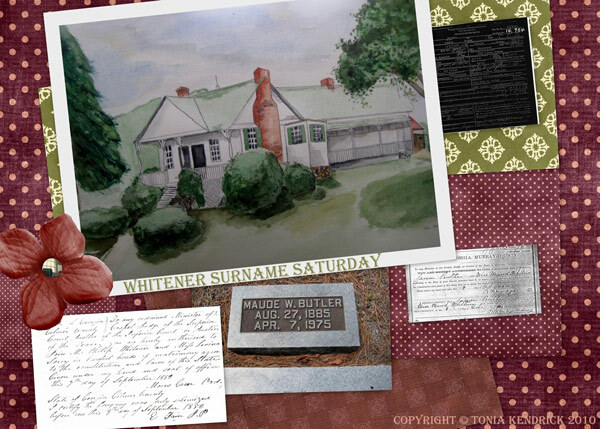 Maud’s father was William Everett Whitener. Bill was born Dec 1855 in Gilmer County, Georgia. He married Roxy Sinyard about 1872 and after her death, he married my great-great-grandmother, Mary Elizabeth Patterson on July 3, 1883. Bill had five children with Roxy and eight with Mary. Bill moved from Gilmer County to Murray County, Georgia sometime between 1880 and 1900. By 1910, he and Mary had moved their family to Foyil, Oklahoma, presumably to be near Mary’s Native American people. After Mary’s death, Bill moved back to Murray County, where he died on January 5, 1937. Bill’s father was Phillip B. Whitener. He was born about 1833 in Lincoln County, North Carolina. When Phillip was a little boy, his family moved to Gilmer County; they appear there on the 1840 census. He married Levina Searcy on September 9, 1852. He served as a private in the Civil War. He made it back home to Gilmer County at or near the close of the war, then was tragically killed by a roving Union gang in 1865, leaving a widow and five small children. Phillip’s father was John D. Wilfong Whitener. I recently wrote about him as the “Most Prolific Father” in my database. John was married three times and had 22 children. He was born in Lincoln County, North Carolina about 1784, where he lived until moving his family to Gilmer County in 1839. John left a great paper trail; he frequently bought and sold land, was involved in court cases (once for adultery! ), served on juries and in slave patrols, and was a constable and justice of the peace. He died in 1855 in Gilmer County. John’s father, Daniel Whitener, was born October 14, 1750 in Anson County, North Carolina. He lived in North Carolina his whole life, except for a brief period in childhood, when his mother moved with the children to South Carolina after they were burned out of their home by Indians. Legend has it that Daniel fought at King’s Mountain during the American Revolution, but the DAR has decided they can accept no more of his descendants without new proof of his service, so that may be a myth. The 1990 census reported 4,974 Whiteners in the U. S., representing .002% of the population. The 1920 census reported 355 Whitener families, with high concentrations only in North Carolina and Missouri. In 1880, there were 440 Whiteners, over half of whom lived in North Carolina. In 1840, there were only 21 Whitener families in the U. S. and 16 of them lived in North Carolina. I’ll bet money that I’m related to all 16 of them. There were only 64 Whiteners who fought in the Civil War and 56 of them were on the Confederate side. I think this further demonstrates that the name was still in the process of migrating from Weidner to Whitener and that Whitener is a Southern variant. A complete list of deceased Whiteners in my database. Posts about Whitener ancestors and relatives in this blog. Whitener documents, photos, and headstones. Order a copy of Daniel Whitener’s will from the North Carolina Archives. Visit Gilmer County Probate Court and look for letters of administration and land records for John Whitener. Look for a copy of Phillip Whitener’s Civil War records on Footnote.com. Find out where Bill Whitener is buried and get a photo of his headstone. Enter Bill’s death certificate info in my database. If you have any additional information (or corrections) on the Whiteners, comments are most appreciated! Butler. I have had your post for long time so I hope you get this. Hi Jack! This is such a coincidence. I’m doing some work on the Whiteners right now and am just about to write a post about William Whitener, Maud and Bertha’s father. It is so nice to hear from you! My grandmother is Maud’s daughter. My 4th great grandfather Henry was Daniels brother, was a Captain at Kings Mountain and there is a Daughters of the American Revolution chapter in his name here in the Fredericktown, Mo area, we also fought for the confederacy in this area, my gg grandfather Francis was a corporal in calvary. They all moved here from North Carolina around 1809..
Hi Steve! Nice to hear from you.